When Harry Hepburn met Chris Briley, it was synergy. That’s a bit of jargon that gets thrown about recklessly, but here it truly applies. The two began sailing together in the summer of 2012 and found that they made a great team, both on board and off. Briley headed the Green Design Studio of Yarmouth; Hepburn worked at Scott Simons Architects in Portland. Soon after, they synthesized their energies, experience, even their surnames to create Portland-based Briburn. A wall of yellow birch greets you when you enter the office and wends its way through the space. Since January 2013, they’ve combined their passion and expertise to develop some of Maine’s greenest properties. Past efforts include net-zero and net-positive residences, like the Viridescent House in Falmouth and Maine Coast Waldorf High School in Freeport. While the projects vary, they are unified by their sustainability and energy efficiency. If the commercial real estate of yore conjures up rows of asbestos tiles and cubicle farms, think again. Briburn has pioneered a new breed of commercial building that is as ecologically sensitive as it is aesthetically beautiful. Briburn’s motto, “Architecture for life,” is the simple yet radical notion that buildings should be built to last and as good for the environment as for the people who occupy them. 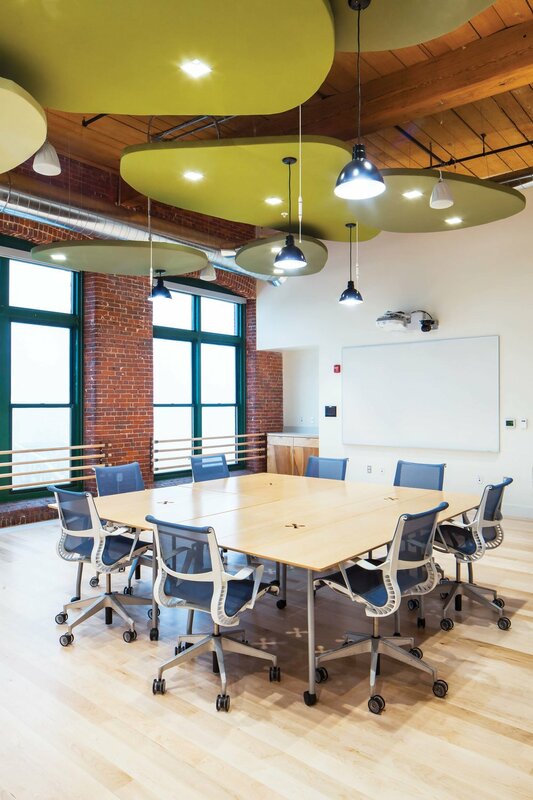 None reflects their vision more vividly than the recent office renovation for The Nature Conservancy of Maine, located in the Fort Andross Mill in Brunswick. Over eight months, Briburn carried the 9,700-square-foot office through a thoughtful update, respecting the historic elements of the mill while using organic, repurposed materials whenever possible to build a workspace that is dynamic, healthy and design-forward. A workstation with a view and plenty of greenery makes good on Briburn’s notion to bring the outdoors in. The space strives to meet Leadership in Energy and Environmental Design (LEED) Gold Certification requirements, which include energy savings, CO2 emissions reduction, and improved indoor air quality, as with their new HVAC system. This space, like many others Briburn has built, is essentially net-zero, meaning it produces as much energy as it uses, thanks in part to the LED lighting connected to daylight sensors and 160 solar panels commissioned by the owner of the building, the Conservancy’s longtime landlord. But Briburn took it even further, implementing aspects of the WELL Building Standard—a criterion that considers the emotional and physical impact of design, rating health and wellness across seven areas: air, comfort, fitness, light, mind, nourishment, and water. In the main conference room, leaf-shaped panels fitted with LED lights help to illuminate the space and absorb sound. Underfoot, carpet tiles made from recycled fishing net temper the acoustics and contain every gradient of blue of a Maine tidal pool. In the center space, the pattern of a larger rug of mottled yellow-green shifts from dark to light, mimicking the waxing and waning of light over an open field. The glass walls of conference rooms are etched with patterns of fish running upstream, while the rooms are quieted by floating, leaf-shaped “clouds” of wood and fabric purposed to absorb sound. Staff may lunch at a kitchen counter hewn from historic log-drive lumber salvaged from the Penobscot River or follow a ramp to the mezzanine for a bird’s-eye view of the Androscoggin, where they once cheered on a moose stranded on a small island. 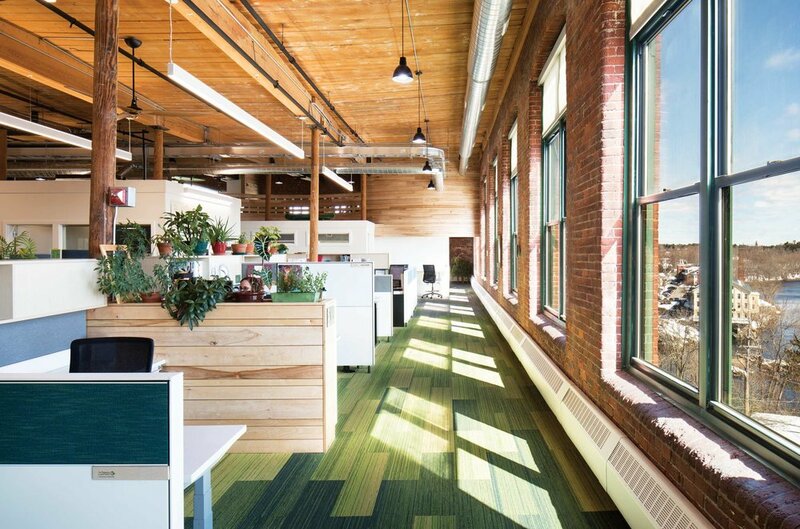 At the moment, The Nature Conservancy is anticipated to be the first workspace of its kind in Maine and one of the first in the nation to receive both LEED and WELL certification. But with interest in greener, holistic development increasing, Briley and Hepburn hope more home and business owners are beginning to see the light. As for the lucky folks at The Nature Conservancy, they don’t have to look far. Everywhere you look light pours in and surrounds them from all directions.